Friday, June 15, 2018, 6 p.m. – 8 p.m.
We are so pleased for this opportunity to serve the community. We hope to meet your needs by providing a place for you to buy gently used materials at outstanding prices! 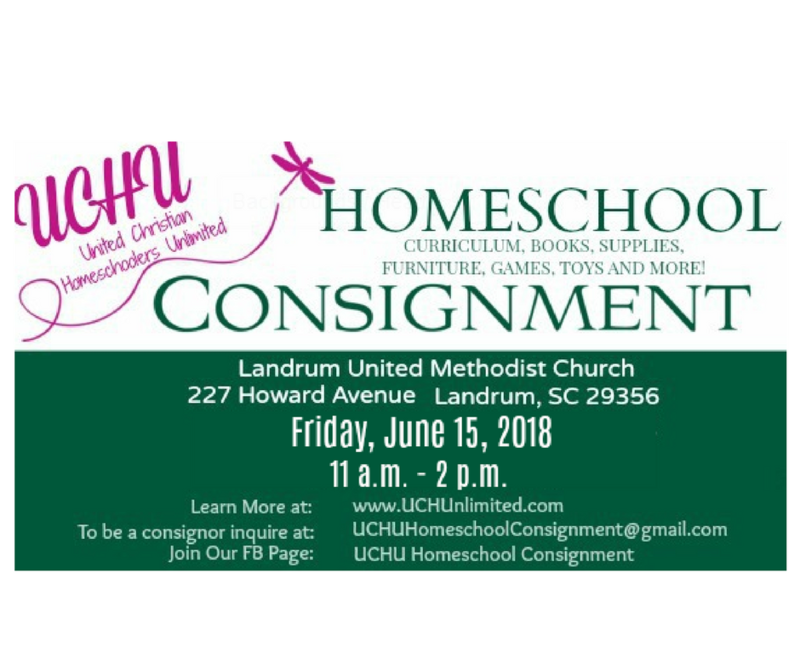 UCHU Homeschool Consignment Class is open to the public with FREE admission. Please note that this is a CASH ONLY sale!! – Thousands of items organized by subject so browsing items is easy. – No pressure to buy. – You are directly supporting another family or teacher by purchasing their items. – Compare similar items quickly and easily. Children are permitted at the sale, but please keep them with you at all times and do not allow them to handle any merchandise that you do not intend to purchase. Please remember that the items at the sale belong to someone else and should be handled carefully. Volunteer so you can shop first! Volunteers shop before anyone else, even consignors! Volunteer spaces are limited so sign up early. The best items go first, so get there early! Bring a tote bag, laundry basket, box, rolling cart, etc. with you to the sale to put your purchases in. You will find some awesome prices and you won’t want to be limited to only what you can carry! Dress comfortably! Comfy clothes and shoes are definitely the way to go. Tuck your money into your pocket so you don’t have to worry about a purse while you shop. Do Unto Others – Everyone wants the best bargains and there’s more than enough to go around. There are some times of the day when lines will be a little longer, so please be patient and remember that the volunteers are working as fast as they can to make sure that you have a great experience at the sale! If you pick up an item that you later decide you don’t want, please either take the item back to the section that it came from, or give the item to a volunteer to put back on the sales floor.